……for foote companies, by Captaine Lazarus Howard of Ailsford in Kent. 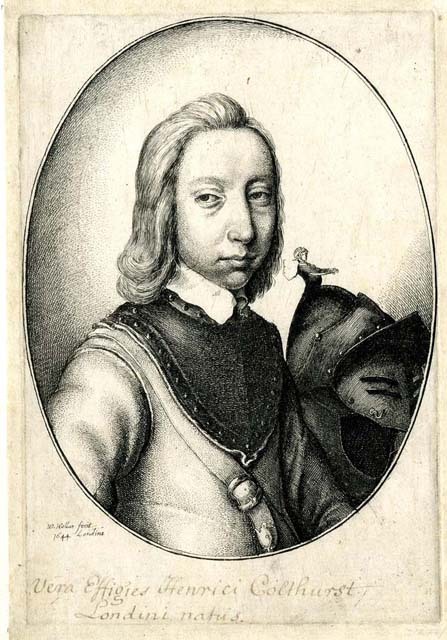 This is the picture on the front page of Captaine Howard’s pamphlet, printed in London, 1645. The musketeer has a plain square cut coat and close fitting breeches with a pot helmet, falling band (darted). He may have been a dragoon as he wears long boots with spurs and boothose. 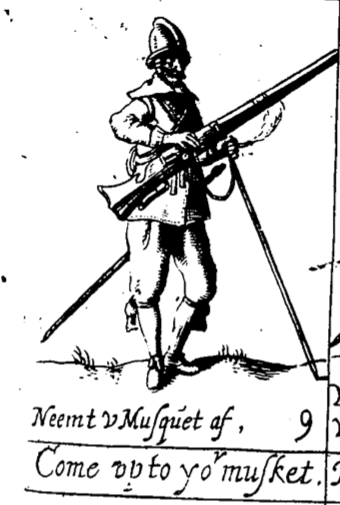 All the accoutrements of a musketeer are present, and a nice example of a matchlock musket. 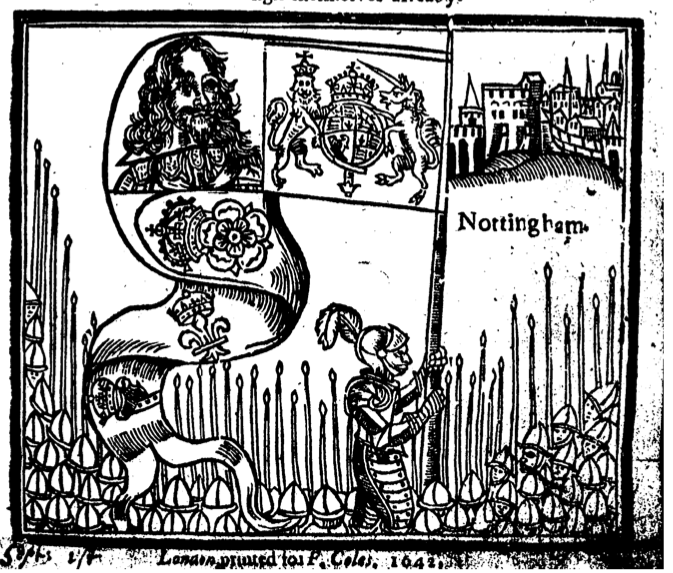 Etched by Hollar in 1644. 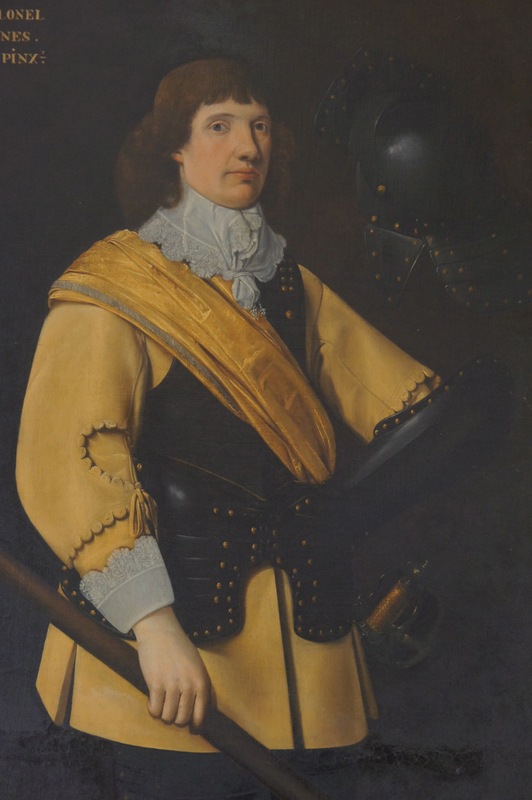 I can find no information about Henry, but he seems pretty well-to-do in gorget and buff coat with a rather splendid full face helm on the table. Plain falling band and a simple baldrick. Note the small buckle. by Richard Elton in three volumes. 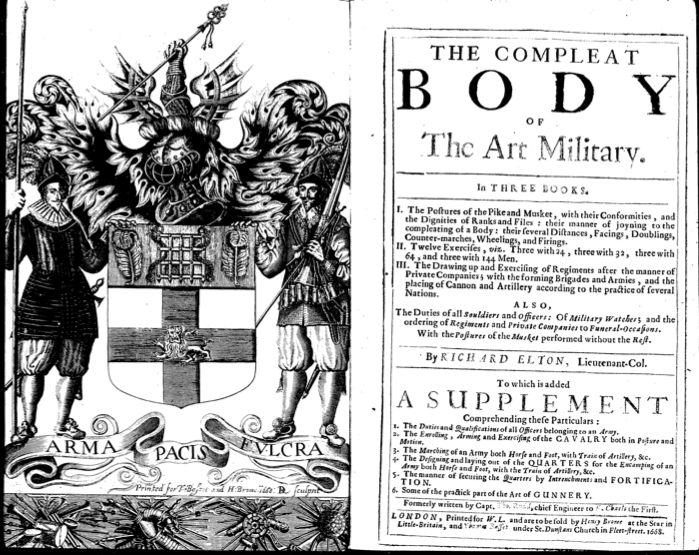 Published in originally in 1650, this is the frontispiece to the 1668 edition, though the clothes worn by the soldiers look much more contemporary to the Civil War or even slightly earlier. 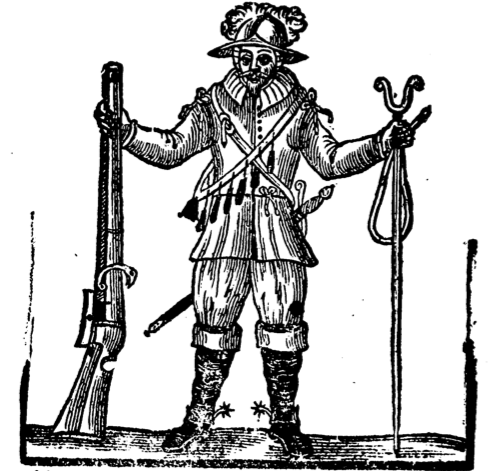 The Musketeer has a nice lacy falling band and showy rosettes lacing up his shoes, a square cut coat with decorative shoulder wings and tightly cut breeches. The Pikeman is in full armour with a collar ruff, breeches tied below the knee and bows on his shoes. Looks a bit more 1630s than 1660s to my eyes. by Captaine Henry Hexham, quartermaster to Colonel Goring. This was printed in the Netherlands and has a lot to say about drill and disposition of troops. 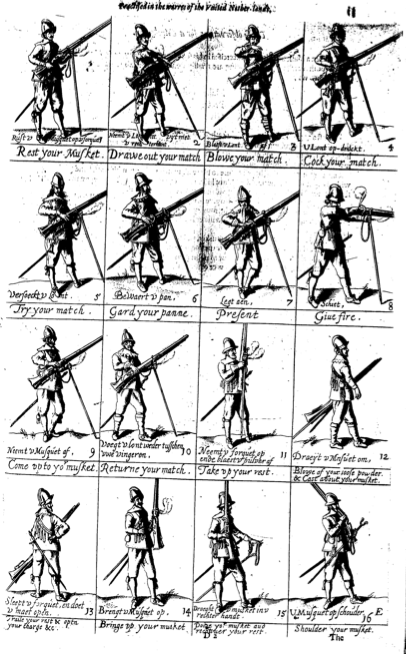 There are some nice plated demonstrating pike and musket drill, this one showing various postures for musketeers. At first sight this looks very English. However, if you look closely the original Dutch captions become obvious. Not a million miles from what they would be wearing in England, but not English soldiers this time sadly. It seems to have been a well attended event with three troops of horse, five hundred foot soldiers and ‘diverse Lords and Gentlemen of His Majesties train’. Lots of helmets worn by those foot soldiers if this picture is anything to go by, though as we have seen it’s not really an accurate source!